Download the example VDMX templates and media files for this tutorial. Along with being able to work with more layers at higher resolutions, faster computers and more powerful graphics cards make it possible to output to multiple projectors or monitors from a single machine. In particular, the new 15" Retina MacBook Pro features a combination of a fast SSD hard drive along with two Thunderbolt and one HDMI ports making it possible for a VJ to power 2 or 3 different HD displays from a single Mac laptop. For this video tutorial we'll walk through the basic steps of preparing VDMX projects with a double-wide and triple-wide design to output with separate source layers for each display. Note that this same idea can also be used on a Mac Pro with multiple graphics cards. Up next try adding the built in iSight camera into the mix, or as a challenge try updating a different template to use multiscreen output. On a Mac go to the 'System Preferences' under 'Displays' to set up your monitor or projector layout. Click on a display to highlight its border onscreen. 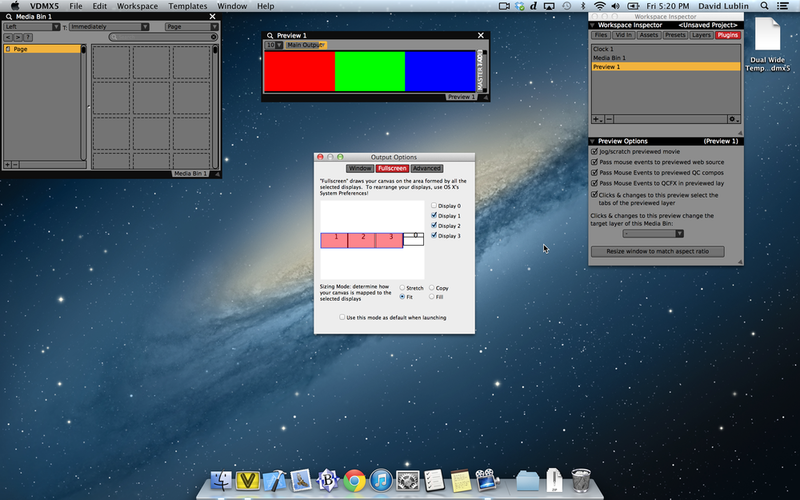 In VDMX press ⌘ + F to open the fullscreen options panel to set which outputs are in use. 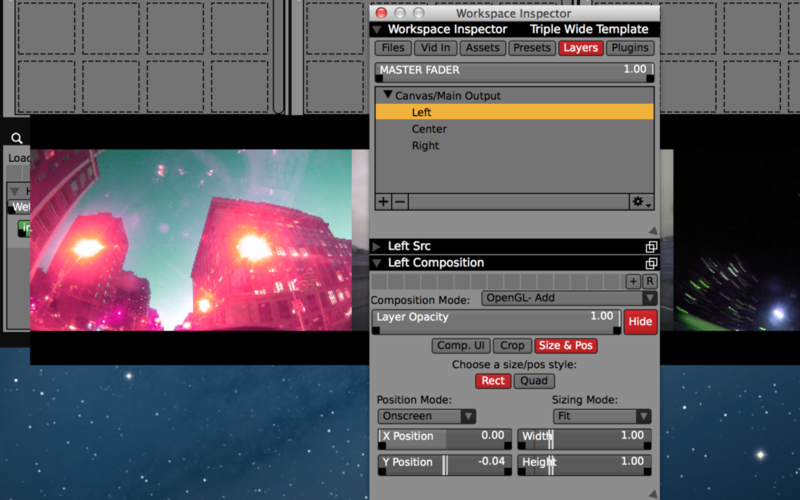 In the 'Layer Composition' controls use the 'Onscreen' positioning mode to anchor layers to the edge of the canvas. Completed 5760x1080 project with 3 layers of 1080p video playing with FX to separate outputs. To get the best playback performance when using multiple layers of HD movies in VDMX on the Retina MacBook Pro you may need to encode your clips using the Hap video codecs. Also make sure to get any needed Thunderbolt to DVI (or VGA) adapters and if you are working with HDMI displays you may also need DVI to HDMI cables or adapters.